Well, with a good chunk of episodes under my belt from many of the different series, I feel it’s now safe to answer that question. Now keep in mind, these are the anime that should not be missed this season—but that doesn't mean all the others are objectively bad; it just means that the following five series are a cut above the rest. Non-Spoiler Plot Summary: In a medieval world where giant Titans roam the lands, the last remnants of humanity hide behind a series of enormous walls. But should the Titans ever break the walls, it is up to the army to stop them with their specialized steampunk technology. Why You Should Watch it: Attack on Titan is a heart-pounding adventure like few others before it. It feels like a cross between the steampunk world of Full Metal Alchemist and the violent, low fantasy world of Berserk. The mystery behind the Titans is compelling and the characters are well-developed—not to mention interesting. And unlike many similar stories about a group of underdogs, the violence and danger are treated realistically—to put it another way, the heroes are all too mortal. Non-Spoiler Plot Summary: Many years after the majority of humanity had evacuated Earth, a young soldier crashes upon the watery planet. There he finds himself upon a floating city where he learns about a culture and lifestyle far different from his own. Why You Should Watch it: Written by Gen Urobuchi (the author of Madoka Magica), Gargantia is, at its heart, a tale of personal growth through the introduction of new ideas. It also looks deeply at the implications of being a one-man super weapon and the danger that position holds for not only the young soldier but also all those around him. Non-Spoiler Plot Summary: When his neutral space colony is invaded, a normal high school student pilots an experimental mobile suit to fight off the invaders—but at a terrible cost. Why You Should Watch it: From the creators of Gundam comes... well, Gundam (only this time it's called Valvrave for some reason). While the basic story setup is hardly original, the way the series plays with that framework is new, original, and often over-the-top awesome. It really looks at how a war in space would be perceived in a world with widespread social media and how a Gundam pilot would be treated by the populous at large—in addition to how major governments would act toward him. More than that, it's a series that pulls out surprise after surprise that you'd never expect—making it an enjoyable ride you won't be able to stop watching. Non-Spoiler Plot Summary: A young girl has led a normal—if sheltered—life in a small mountain town. Yet, odd things happen whenever she touches electronics, causing them to be destroyed. But little does she know that entering high school will take her into a world of spirits and magic—a world hidden within our own. Why You Should Watch it: Just as Harry Potter merged western magic and wizards with the modern world, Red Data Girl does the same with Japanese magic and shamans. When it comes down to it, it's a coming-of-age story about finding one's self. Though it is not as action-filled as the other anime on this list, it is still drama-filled—yet, manages to never descend into overly melodramatic territory. Non-Spoiler Plot Summary: When the Demon King is defeated by the Hero, he and his last minion escape their fantasy world and land in modern Japan. But with no marketable skills and running low on magic, the Demon King is forced to get a fast food job and begin his conquest of both worlds from the very bottom of the pecking order. Why You Should Watch it: The Devil is a Part-Timer! could have been nothing but your standard fish-out-of-water comedy. Instead, the whole scenario is turned on its head by continuously showing how well acclimated the Demon King is to his new life. The resulting story is a comedy satirizing not only fantasy world clichés, but also life as an entry level employee in modern Japan. Want a second opinion? 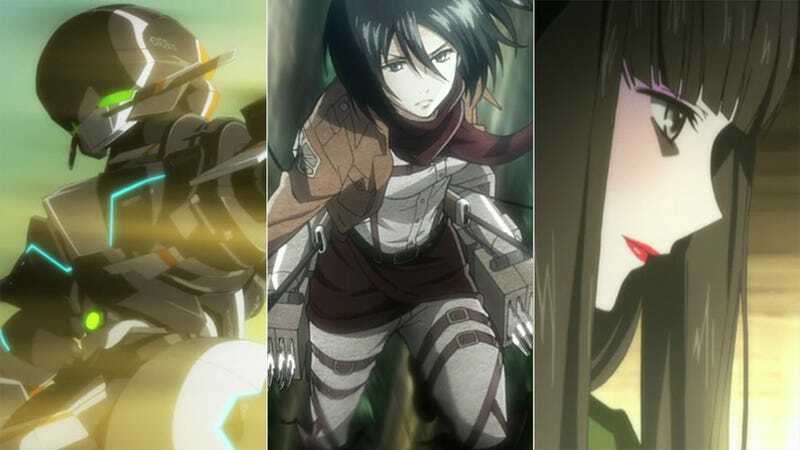 See what our friends over at io9 had to say about the anime this season. Stay tuned to Kotaku East for our article coming later this week on the other anime this season (and why you can skip them). And if you would like to chat about all things anime, head over to Talk Amongst Yourselves: ANI-TAY.